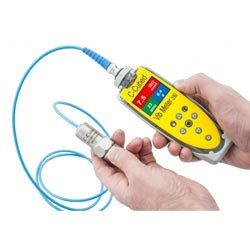 The impact meter Vib Meter 330 is a vibration monitor and impact analyzer that is easy to handle without requiring any special training. 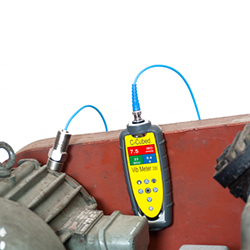 The impact meter performs an automatic vibration analysis based on the machine's running speed in order to detect any faults like imbalances, faulty justifications or loose elements. Abrasions of the bearing and faults of the run-time as well as the machine's speed are recorded by the impact meter. Those are then displayed by color-coded alarm levels following international alarm-codes. That analysis allows a preventive detection of failing machines or facilities. The impact meter Vib Meter 330 measures a frequency range between 10.2 Hz and 1 kHz for ISO and between 1 kHz and 10 kHz for BDU. The display features a zoom function and is built according to current technological standards. You can chose between various units: g for acceleration, mm/s or inch/s for speed and BDU for noises in the bearing. The system is designed to perform analysis on oscillations of facilities (e.g. pumps, engines, air - blowers and bearings). Furthermore the impact meter features a BNC input for external acceleration sensors. The impact meter beats competing models by far due to an administration system for the measurement points: each measured value can be assigned to a measuring point. The impact meter Vib Meter 330 saves the measured values, alarm levels and settings on a non- volatile flash-memory. The recorded data can be easily recollected from the data memory. As soon as the impact meter is synchronized with the software included in delivery, the measured data can be easily further on processed on a computer. 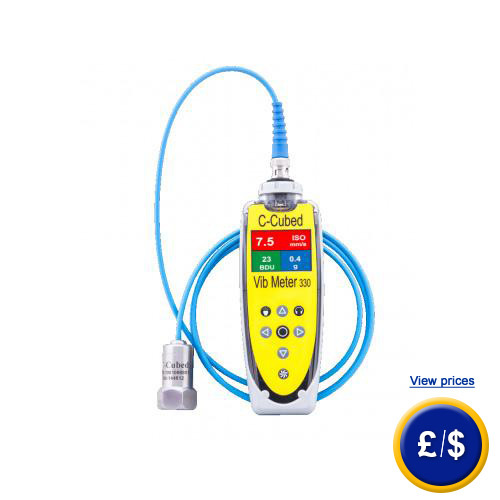 If there are any questions about this impact meter, please have a look at the technical specification below or call: UK customers +44(0) 23 809 870 30 / US customers +1-410-387-7703. Our technicians and engineers will gladly advise you regarding all accelerometers and all products in the field of measuring instruments, regulation and control and scales.